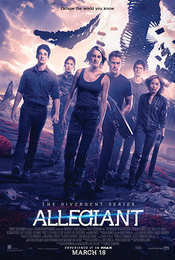 Allegiant is the third in the Divergent series and as with most it is going to be split into two films. After the defeat of Jeanine it seemed like peace was definite, but that is not the case with the brutal executions of everyone who supported her. This includes Tris's brother who is freed by her and Four to escape. Beyond the wall, they encounter David who is looking for Perfect people and not ones who are damaged. This is either a new paradise or a new dictatorship. It is up to Pris and her friends to find out which one it is. If there was ever a series in desperate need for a "Previously on..." it was this one. I had seen the previous two films, but I was thrown into this film without a clue about what was going on. About twenty minutes in, I actually had to stop the film and go away and watch the previous two films before I could understand what was going on. I'd like to say it helped. But it didn't. My biggest problem is that apart from the obvious overthrowing of Janine's regime I never really understood what the characters were fighting for in this film or indeed why. This film is a mess. An utter mess. I'm not sure what I was watching or indeed what was going on. I had seen The Hunger Games and The Maze Runner and this film series once again felt like it was just riding their coat tails and this is definitely the weakest. It could be argued that maybe it will make more sense once Part Two is released, but I don't think it will. By the end of the film I was left with no sense of urgency to watch the next and to be honest if I don't get to see it, I don't really care. The film looks fine in general, set pieces and the CGI is not as distracting as in some films. However, there is simply nothing from the film that stands out. This is not the eye catching spectacular of Katniss and Peeta riding a flaming carriage or the adrenaline rush of Thomas running through the maze, but instead just another future world that could clearly be anywhere and part of any franchise. The cast do what they can with the material, but you can almost see them struggling with what they are supposed to be doing. This is a shame as in the first and even the second film Shailene Woodley was perfect as Tris and Theo James as Four had that stoic strong hero thing that worked. Here in this film they are boring and characters I simply do not care about. Even solid actors like Naomi Watts, Octavia Spencer and Jeff Daniels as David can simply not raise the material they have to work with and unlike Kate Winslet in the previous two films, almost feel just like cameos rather than fleshed out characters. Extras include a Commentary which is fine in general and you can tell that the makers really wanted to make a great film. Maybe if they had made an epic film of the two books, rather than split them up to gain more profit from two releases it would have been better instead of the almost half-finished film that it is. The two featurettes are short looks at the adapting of the book and the battle in the Bullfrog. Both are far too short to mean anything and maybe if there had been more extras it would make the set more worthwhile. Allegiant feels half-finished and maybe that is because it is. I could be optimistic and say that when the second part is released and this is watched as whole then it will be a much better viewing. However, there was simply nothing about this film that makes me want to watch that film. This is the weakest of the series and the critical and commercial backlash has been overwhelmingly negative. There nothing about this film that would make me recommend it anyone else and that is the sign of a very bad film.